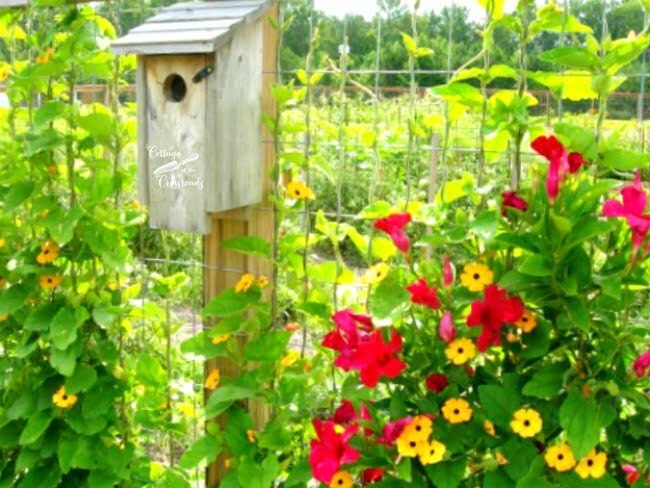 We have a large flower bed that is located in front of our vegetable garden, and all winter long I have been planning on creating a cottage garden in this area. You see, this area has not received much attention in the past few years, but it really is the first thing that one sees when approaching our home. Here is a photo of this area that was taken early last summer and as you can see, the area looked OK but was lacking the WOW factor. Before changing up this area, I thought it would be fun to look back at how it all developed. 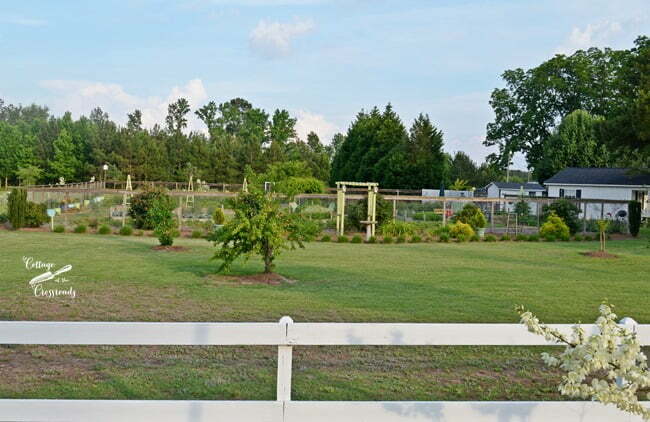 Back in 2010, shortly after Leo and I moved to the Crossroads and after we decided to start a vegetable garden, we had the area enclosed with a tall fence. That’s because deer lived in the woods behind our house and we knew that they would probably eat some of our veggies if we didn’t install a fence. Even with the fence, the deer ate some of the pole beans that we had growing up the fence that first year but now they don’t come around much. 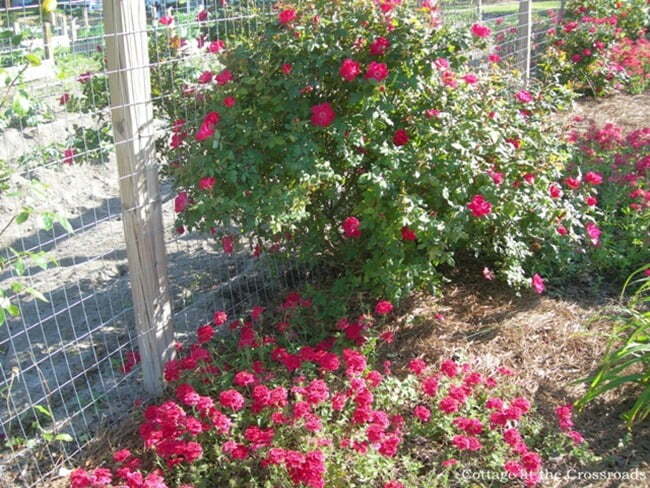 To me, the fence provided a perfect place for climbing roses so we created a flower bed in front of the garden. This area is quite large with a length of 96 feet so I proceeded to alternately plant climbing roses and Knock Out roses along the fence. You can see how small they were in this photo. We also attached a few bluebird houses along the fence to give our feathered friends a home and also gave them a birdbath to enjoy. 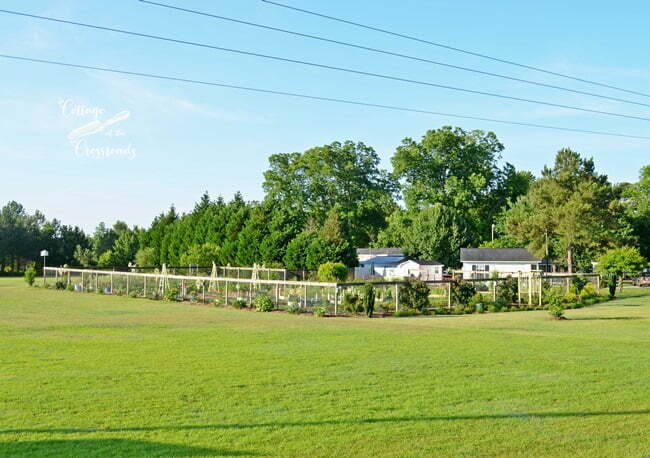 You can also see some small mophead cypress plants here as well as many liriope plants that went in that first year. Even though we heavily mulched the bed, you can see the weeds beginning to peek through. That first year we could not stay ahead of the weeds because the flower bed was in an area that was formerly a field. Yet despite the constant weeding, I was proud of the beginnings of my cottage flower garden. I also planted other traditional cottage flowers that year such as foxgloves, cleome, and hollyhocks. And Leo and I were as proud as could be of the veggies that we had growing that first spring, too! 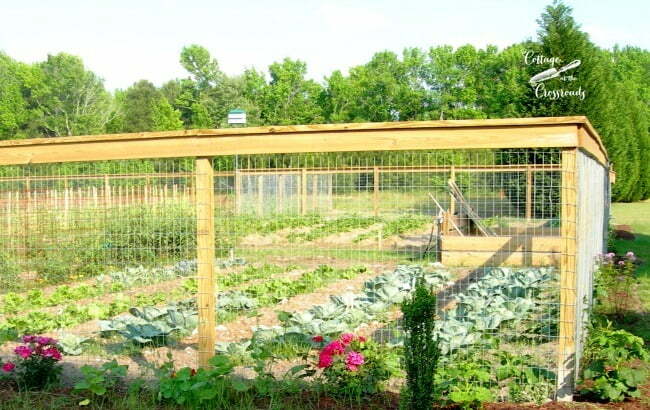 This photo was taken later that summer and you can see how things filled in and the beans that grew on the fence. It was a profusion and riot of color and I loved it. This was all before we started blogging. The next spring Leo put up an old arbor that our neighbor didn’t want any more. 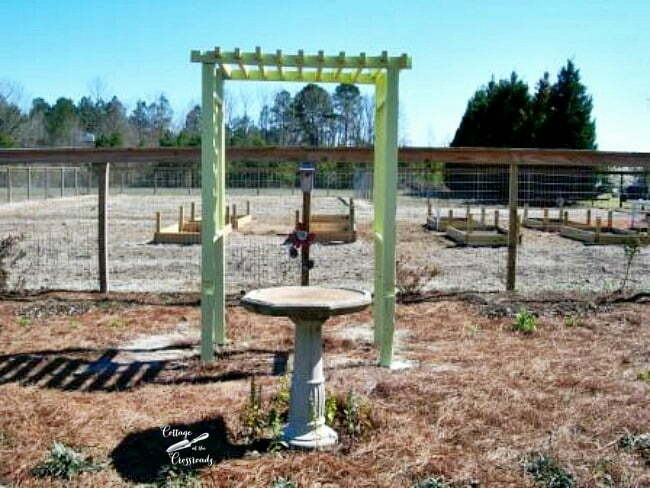 You know, you just can’t have a cottage garden without an arbor, can you? I promptly painted it green and planted some climbing roses beside it. 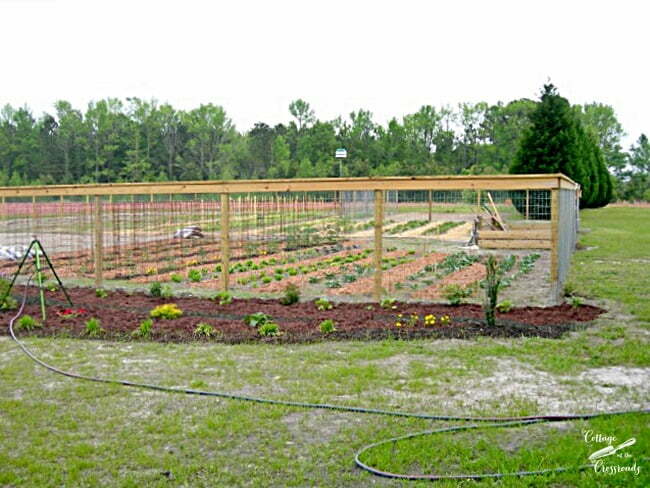 In the background, you can see some newly built raised beds in our vegetable garden. Matching birdhouses were added to the arbor that year. 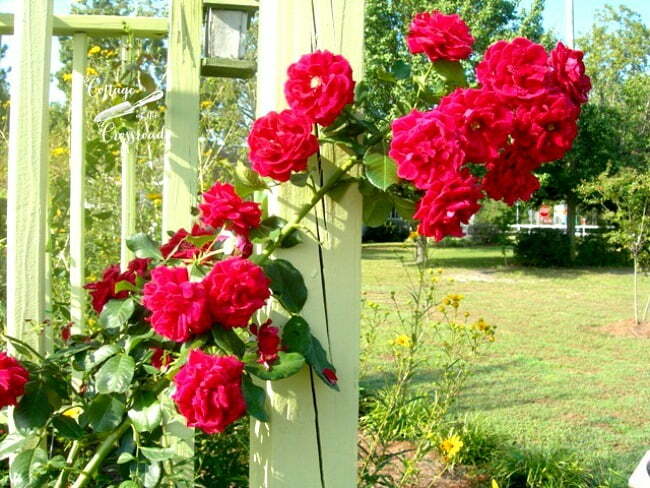 The roses took off and bloomed beautifully all that summer. 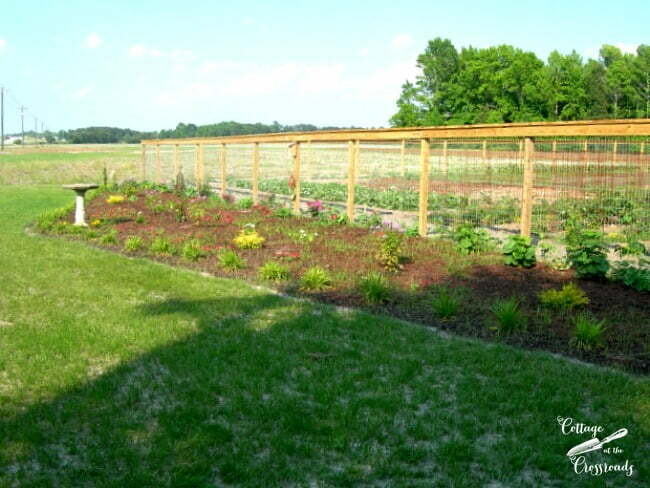 And that was the same year that I planted lots of black-eyed Susan vine seeds along the fence. They created a wall of sunshine-y yellow color. They have kept reseeding themselves, and to this day, I still have some of them coming up. 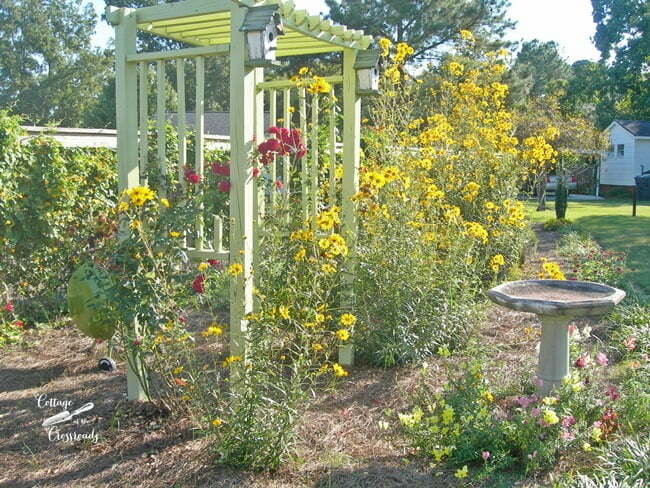 The Knock Out roses and the verbena continued to grow and spread providing lots of color. And those “swamp sunflowers” that I had planted the first year grew gigantic the next season. It was only after a reader told me how invasive they could become that we dug them up and planted them near the edge of the woods behind us. The following year we added some evergreens in pots to the bed. Eventually they outgrew the pots and they were planted in the ground. They and the mophead cypress plants provide color and texture to the bed during the winter months and you should see how large they are now. So for the past two years, this flower bed has been a little neglected. 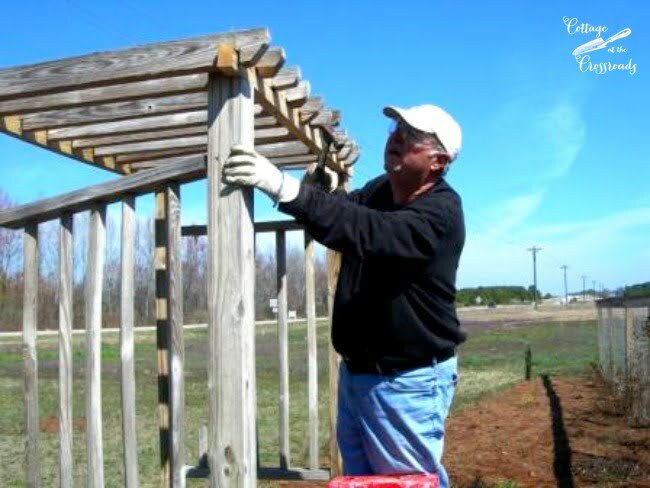 The roses on the arbor succumbed to black spot and were removed. One of my goals earlier this year was to revitalize and improve this area and get it looking like a real cottage garden again. So we’re excited to announce a partnership with Smartpond to create a water feature in our flower garden. Stay tuned and we’ll tell you all about it! « All Things Painted and a Giveaway! Hi Jane! Oh, your gardens are just gorgeous! I love everything about it and you certainly have a green thumb. I can’t wait to see how this area develops! 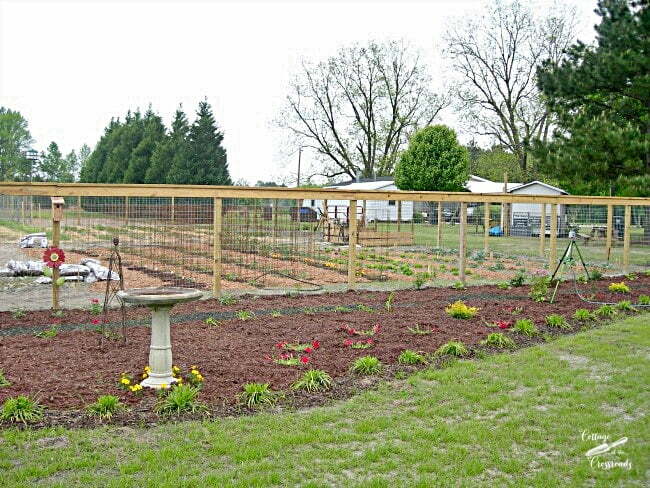 If it’s half as pretty as your vegetable garden it will be outstanding! 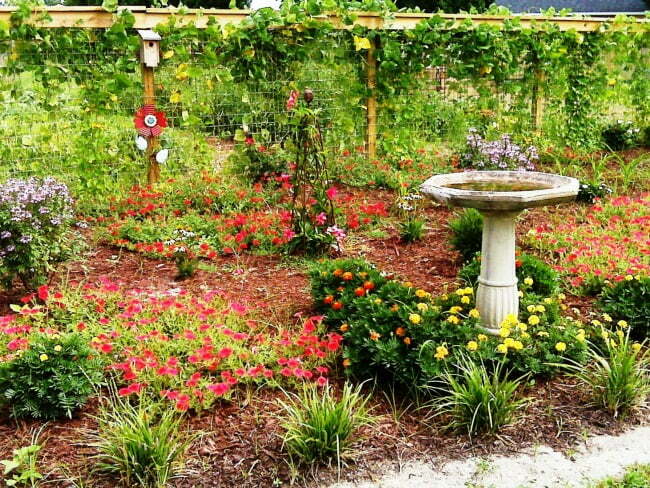 I planted a black-eyed Susan vine this year….Hope it does well…I have a perennial bed that gives me a fit with grass and weeds every year…..any suggestions? Your garden is spectacular! And I love watching the changes in your cottage flower bed. Something new and different all the time. Can’t wait to see your water feature! I am going to use Paul Nelson’s idea about onions and garlic for the deer. 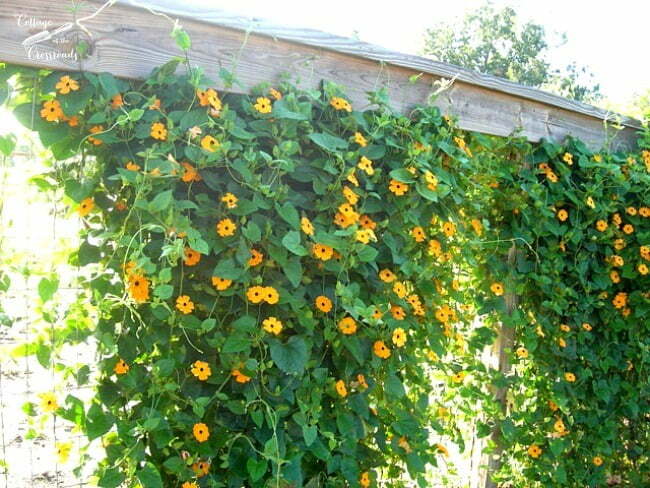 I wish I could get black eyed Susan vine to be half as prolific as yours. You are awesome gardeners! Oh my gosh you two should be so proud…really. What an accomplishment. Can’t wait to see what you do this summer! I am in complete awe of you and Leo and your amazing garden. Just wow. I would love to have a garden like that! Of course I’d need you both to help me figure it out. lol I love it!! Your narrative is lovely and your beautiful photos brought your home to life! I had such fun learning about how your garden grew from year to year. You all have really worked hard and it shows! Plus, you’ve given me some great ideas! 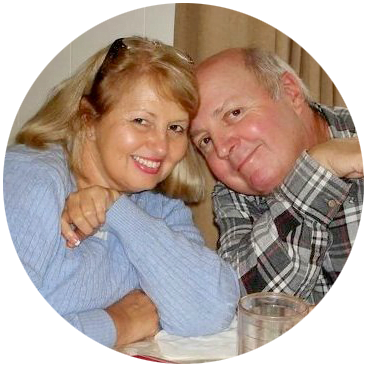 Thanks for such a terrific blog!! Everything was beautiful but changes are good and makes things exciting so next water garden,can’t wait. I love seeing every detail of your enchanting gardens and how they’ve changed over the years. And how exciting to be adding a water feature! Your garden is stunning. You and Leo have done a great job. Lots of hard work has paid off. Your garden is so beautiful. I had to go back through the pictures a few times to take it all in. Just gorgeous. Paul, you are so clever to plant onions at the edge of your gardens! And thanks for that tip about using the jug of water with the garlic cloves as a deer deterrent! I will have to pass that along to people who ask what to do about the deer eating their veggies! We are over-run by deer at my house and they eat everything! I would love more details on how to do the onions and garlic water! Just wait until ya’ll see the Smartpond water feature Jane and I just completed. Looking forward to the feature. Miss my kio pond so will enjoy ya’ll. 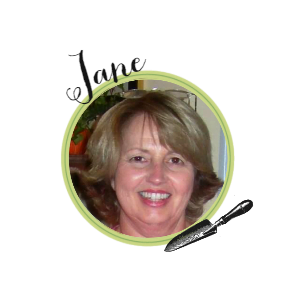 Oh, Jane – this is so pretty! I needed this today. Felt like I just took a little walk in your garden. Getting seeds in the mail this week to you – hope they make you smile like you just did for me 🙂 Have a great day!! Sheila, look for the seeds anywhere flower seeds are sold. Be sure to get the ones labeled Black-eyed Susan VINES! Or, any garden center should have some plants already started right now. 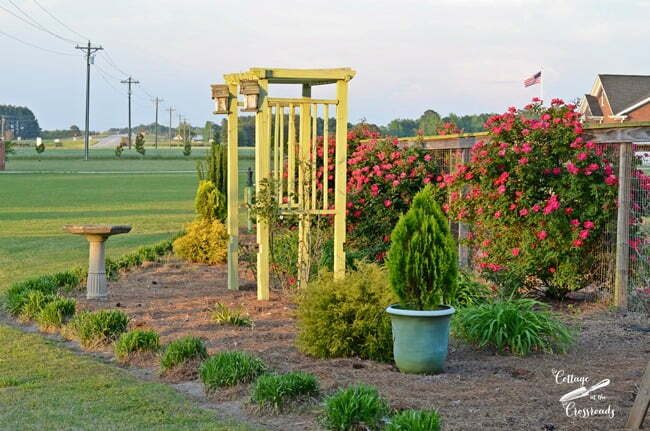 The vines need full sun and look spectacular on a topiary as well as a fence. I’ve even seen them used in hanging baskets although I’ve never tried that. Where do you two find the time and energy for all this, I know it is a labor of love but there is only so much time in a day. And you blog too. Have a great summer, I’ll be watching and trying to keep up. Now that was a big fat lie, I have to get started first. I did buy a few flowers for the pots. Does that count? We have a ton of deer too, Jane. Last year my tulips were so pretty. Then the deer bit off just the heads! lol They are still laughing about it!!! I love your gardens…this all sounds so wonderful! I just love looking at pictures of your garden. It is absolutely dreamy. Hard work I am sure, but so worth it when everything is blooming. I put two trellises up along a white wall of our garage and promptly painted them green! Now, the honeysuckle (coral) on both of them is so wonderful in the late spring. 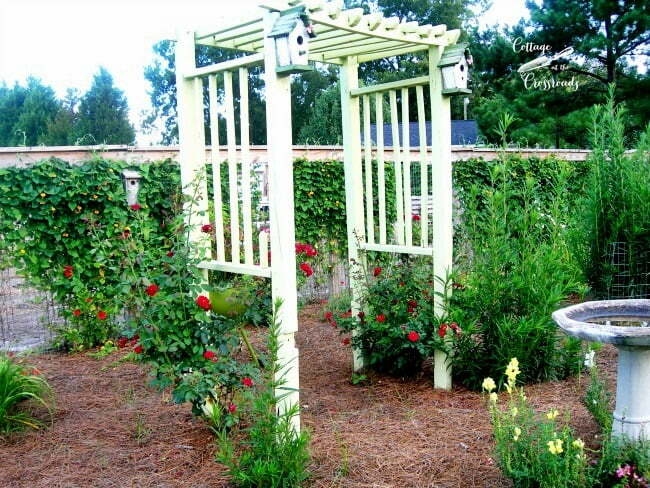 But I love the painted trellis and love your arbor! wow, what a lot of changes you have made…and yes, what a lot of work!! Beautiful and I can’t wait to see what you do with the pond.. So beautiful Jane! Thanks for the tour!